This is the introduction to a new report from the Center for Demographics and Policy at Chapman University. The report was authored by Joel Kotkin with contributions from Wendell Cox, Ali Modarres, and Aaron M. Renn. Download the full report here (pdf). No phenomenon more reflects the sheer power and appeal of urbanism than the rise of megacities, which we define as an urban area with more than 10 million residents (defined as areas of continuous urban development). Until recent decades there were only three — Tokyo and New York, joined by a third, Mexico City, only in 1975. 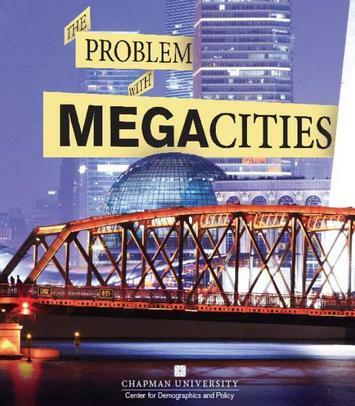 Now the megacity has become a global phenomenon that has dispersed around the planet. There were 29 such cities in 2014 and now account for roughly 13% of the world’s urban population and 7% of the world’s total population (Figure 1). Urban boosters such as Harvard’s Ed Glaeser suggest that megacities grow because “globalization” and “technological change have increased the returns to being smart.” 2 And to be sure, megacities such Jakarta, Kolkata (in India), Mumbai, Manila, Karachi, and Lagos — all among the top 25 most populous cities in the world — present a great opportunity for large corporate development firms who pledge to fix their problems with ultra-expensive hardware. They also provide thrilling features for journalists and a rich trove for academic researchers. Like Mr. Glaeser, many Western pundits find much to celebrate about the megacities mushrooming in low-income countries. To them, the growth of megacities is justified because it offers something more than unremitting rural poverty. But surely there’s a better alternative than celebrating slums, as one prominent author did recently in Foreign Policy bizarrely entitled “In Praise of Slums”3. As demonstrated in our new paper on global cities developed with the Civil Service College of Singapore, many of these emergent megacities in Africa and elsewhere in the developing world lack of an economic basis sufficient to substantially compete beyond their national or nearby regional markets. As a result, the rise of megacities in the developing world may be laying the foundation for an emerging crisis of urbanity, where people crowd into giant cities that lack of the economic and political infrastructure to improve their lives. At the end of this paper, we try to suggest that they may be better solutions that steer growth to smaller cities and towns, and even seek out ways to improve the life in rural villages. Submitted by tuananhphut on Fri, 09/12/2014 - 12:01. Submitted by yimyshuai on Fri, 08/29/2014 - 04:17. After reading this passage, I learned a lot of things which I have never known before.I think I should read something about this aspect more often. Submitted by yimyshuai on Fri, 08/29/2014 - 04:12. This is the most useful report I have seen recently. I really got a lot news from the report. Much appreciate this report!